Séminaire : Jan Willem Duyvendak « What does ‘belonging’ mean in a ‘republican’ city? 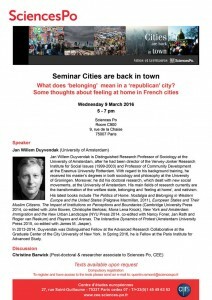 Some thoughts about feeling at home in French cities », Mercredi 9 mars 2016, 17h-19h. L‘inscription est obligatoire pour les externes à Sciences Po. Les inscriptions sont ouvertes jusqu’au mercredi 2 mars 2016 à 15h. Pour vous inscrire, merci d’envoyer un mail à : quentin.ramond@sciencespo.fr. Compulsory registration for the external people to Sciences Po. Registration is open until March, 2nd 2016, 3 pm. Please send an email to : quentin.ramond@sciencespo.fr. For the external people to Sciences Po: You will have to arrive 10 minutes before the beginning of the seminar and to provide you with your identity papers. Jan Willem Duyvendak is Distinguished Research Professor of Sociology at the University of Amsterdam, after he had been director of the Verwey-Jonker Research Institute for Social Issues (1999-2003) and Professor of Community Development at the Erasmus University Rotterdam. With regard to his background training, he received his master’s degrees in both sociology and philosophy at the University of Groningen. Moreover, he did his doctoral research, which dealt with new social movements, at the University of Amsterdam. His main fields of research currently are the transformation of the welfare state, belonging and ‘feeling at home’, and nativism. His latest books include The Politics of Home. Nostalgia and Belonging in Western Europe and the United States (Palgrave Macmillan, 2011), European States and Their Muslim Citizens. The Impact of Institutions on Perceptions and Boundaries (Cambridge University Press 2014, co-edited with John Bowen, Christophe Bertossi, Mona Lena Krook), New York and Amsterdam. Immigration and the New Urban Landscape (NYU Press 2014, co-edited with Nancy Foner, Jan Rath and Rogier van Reekum) and Players and Arenas. The Interactive Dynamics of Protest (Amsterdam University Press 2015, co-edited with James M. Jasper). In 2013-2014, Duyvendak was Distinguished Fellow at the Advanced Research Collaborative at the Graduate Center of the City University of New York. In Spring 2016, he is Fellow at the Paris Institute for Advanced Study. Séminaire : Talja Blokland « When Zoe bit a Teacher: Institutions, stigmatization and the construction of the ghetto » , Mercredi 20 janvier 2016, 17h-19h. Séminaire : « Mobilités sociales et rapports de classe », 9 mars 2016, 14h-18h.